Gwen Moore and Chris Matthews. Photo by Michael Horne. Over the past few election cycles Milwaukee’s Lakefront Brewery has evolved to become the location of choice when Democrats gather for political rallies. 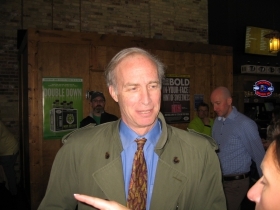 As far back as 2004, Chris Heinz, whose stepfather John Kerry was running for president, appeared at a party rally at the brewery. There have been many other events over the intervening years. It is safe to say, that at least for Democrats, Lakefront Brewery is occupying the position once held by Serb Hall. Lakefront’s political stature has only been strengthened over the past few days as the cable news network MSNBC — your network for liberal leaning news junkies — has set up shop there to broadcast 2016 Wisconsin presidential primary information live from the Cream City. 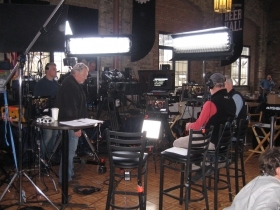 Somehow his brewery, located on the Milwaukee River at 1872 N. Commerce St., came to the attention of the folks at MSNBC as a possible site for their broadcast of election coverage, including shows by Chris Matthews and Chris Hayes. Klisch said he got to the brewery one morning at 3:30 a.m. to show the advance team around. “I don’t know how they do it,” he said Monday, surveying the crews that work long hours putting on network news shows. As he spoke, the star of “Hardball with Chris Matthews” was taking a look around the place, and posing for photographs just as if he were a candidate himself. The old Bernie Brewer’s Chalet, a former fixture of County Stadium, had been converted into a makeup studio where Rep. Mandela Barnes was getting his makeover prior to his appearance on the show. The television crews are set up in the middle of the hall where the polka band usually goes. 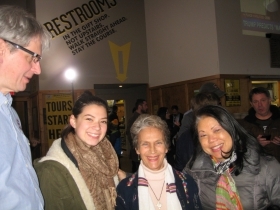 The cameras face into the room, giving the show some verisimilitude, as the tourgoers at the brewery become the background extras in the television production while the talking heads command the screen. 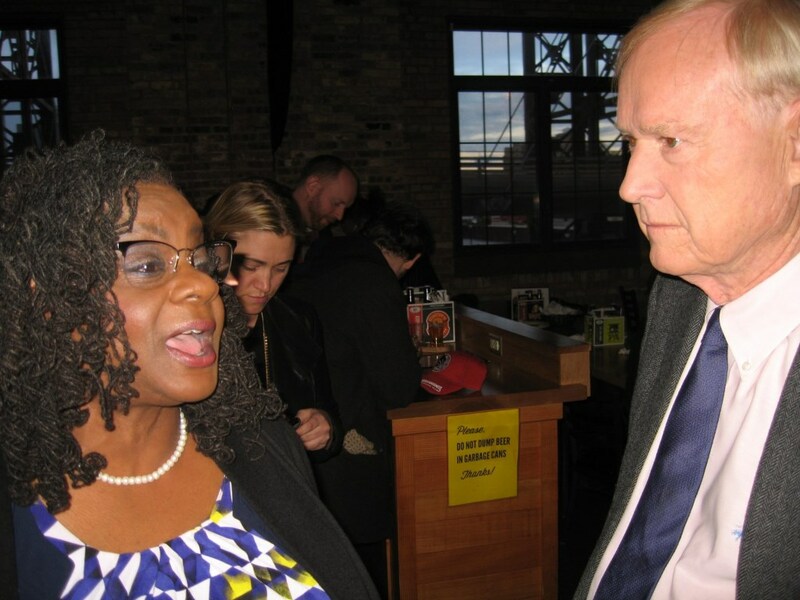 One of the heads chosen to talk Monday was Rep. Gwen Moore, who was greeted at the door by Klisch and by Julilly Kohler, who was seated at a table behind Matthews. “I’m going to need a Bloody Mary after this!” Moore said, referring to her impending interview by Matthews. After her segment, Craig Gilbert and Mary Spicuzza of the Journal Sentinel were interviewed by the host, explaining the ins and outs of Wisconsin politics, while Moore sipped the tomato cocktail that Klisch was able to materialize. Gilbert and Spicuzza had their makeup and hair done right in their chairs before the cameras, but before the cameras were turned on. It was like watching a barber shop. 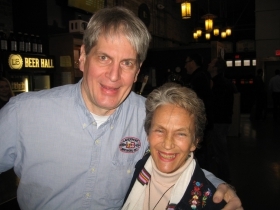 Keith Schmitz was there as a party activist, while Craig Schanning and his wife, Assistant City Attorney Mary Schanning, were joined by their friend Mike Chaltry, who, as a tuba player with the Squeezettes, is plenty familiar with Lakefront Brewery. They were there for dual purposes, half of which was beer. Mme. Attorney Schanning was wearing a Brewers hoodie, making her presence at Miller Park on opening day, and consequent absence from work, quite apparent. But we won’t tell. Kohler spent some time talking with Chris Hayes, a family friend. This was done off camera, during a break. This was not the first visit to Milwaukee for Hayes. About 10 years ago when Victor Pickard tied the knot with Julilly Kohler-Hausmann in a Turner Hall ceremony, Hayes was sent on a most crucial and important mission: He was to race back to the Kohler house and search for one little thing that had been forgotten in all of the nuptial excitement: the wedding ring. Sue Black and Chris Larson. Photo by Michael Horne. 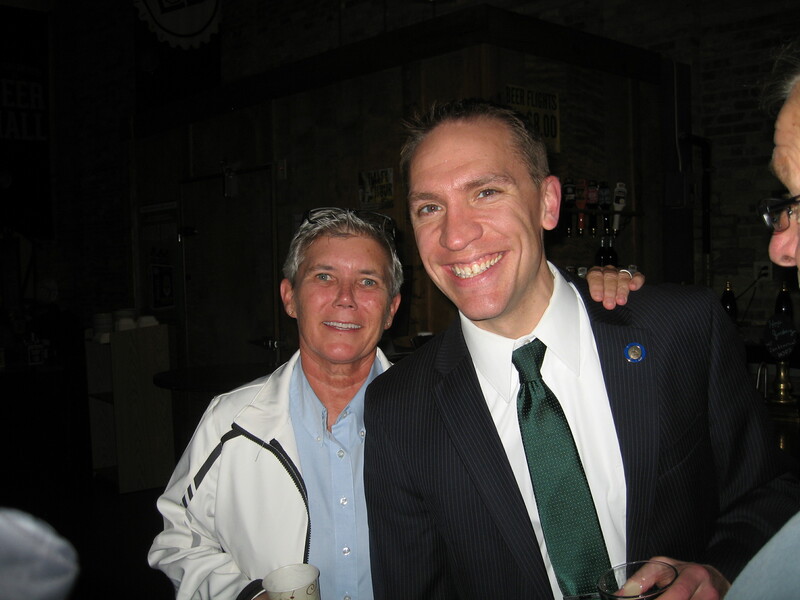 Just last Friday a rally for County Executive candidate Chris Larson took place at the brewery. Among the surprise visitors was Sue Black, who flew in from her job as Parks Director of Arizona to campaign for the man who wants to replace the man who fired her from her Milwaukee County Parks job. Mayor Tom Barrett stopped in for good measure, though he hasn’t officially endorsed either candidate, as did Rep. Barnes. 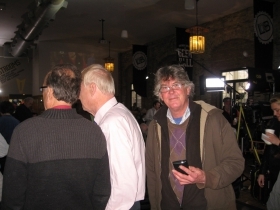 In February, the brewery had been filled to its 450 person capacity to view a debate of the Democratic Party presidential candidates debate broadcast from UW-Milwaukee. Martin O’Malley, then the governor of Maryland and later a presidential contender, appeared at the brewery to support Democrat Mary Burke in 2014 when she ran for governor. As for Serb Hall, it is no longer favored by Democrats. On election night, it will be the site of a party held by and for Republican Presidential hopeful Ted Cruz. 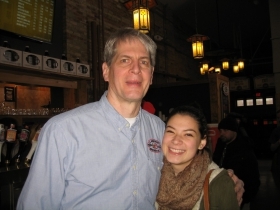 I wrote a Bar Exam about Lakefront Brewery in September 2015. Russ Klisch told me he had been contacted by the Cruz campaign to do a rally there on Monday. He told them they were welcome to do so but that MSNBC would also be there. Cruz’s folks declined but Klisch said the MSNBC crew would have been delighted. And there’s plenty of room. That was perhaps the reason Lakefront beat out the other two sites that were finalists: the Public Market and Mader’s. And Matthews was reportedly pleased that a full house materialized for his show.